The team from Atwater FFA took the first place honors for the First High Team A at the 57th Annual State FFA Cotton Judging Competition held at Fresno State. 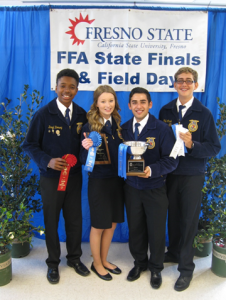 Lemoore FFA took first place in the B competition. Team members judged cotton lint, seed, bolls, plants, and took a general knowledge test of the California cotton industry. Taking home individual honors was Atwater’s Amanda Skidmore in the A competition and Firebaugh’s Austin La Salle in the B competition. Bruce Roberts from Fresno State coordinates and hosts the competition, which was held on Saturday, November 8th this year. The California Cotton Ginners and Growers Associations, the California Cotton Alliance, and Supima are sponsors of the annual event held on the campus of Fresno State. Congratulations to all who competed! This entry was posted in NEWS & ISSUES on November 13, 2014 by ccgga.